There's fun to be had when you start using the JD-XA's analogue and digital elements in combination. 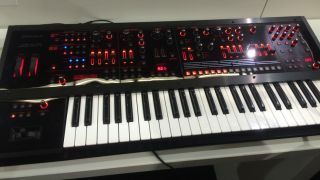 MUSIKMESSE 2015: Roland's press conference at Musikmesse 2015 gave us our first chance to get up close and personal with the finished version of its new digital/analogue synth beast, the JD-XA, and we liked what we saw. As with the recently released JD-Xi, the XA has both digital and analogue engines under the hood, but with four parts from each, alongside a drum section, effects and a multitude of filter and modulation options. In fact, the capabilities of the XA go far beyond those of its smaller sibling. Our first impression is that the marriage of digital and analogue elements has been handled very well. The analogue engine alone is warm and reminiscent of the sound of Roland's classic analogue polys, while the digital part excels at crisp metallic tones, bell-like sounds and complex textures. It's when these parts are brought together, however, that the scope of the XA is fully revealed. Blending and routing each part through the various analogue filter modes is really inspiring, and once you add in the built-in effects, the XA can kick out some truly stunning soundscapes.